Warning: spoilers for the This Is Us episode "Vietnam" ahead. Man, those This Is Us writers are geniuses, and the latest episode can absolutely attest to that. 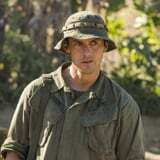 Episode four, "Vietnam," tells the story of Jack Pearson's past - from the birth of his younger brother Nicky, all the way through his life-changing time in Vietnam - but the subtle hints throughout the episode that connect so strongly to his future are why we can't get enough of this show. Since the series premiered more than two years ago, Jack's past remained a mystery, his relationship with his brother was rarely explored, and the most we knew about his beloved necklace was that he gave it to Kevin after the boy was injured during his high school football game. During this week's episode, we see Jack's necklace for the first time on a mystery woman at his camp in Vietnam. In the gloomy scene, Jack is speaking with another soldier when a young local boy runs up to him holding a big fish he captured. Although the soldier scoffs at the young boy, telling Jack that he's just going to kill the American soldiers when he turns 15, Jack is compassionate, gawking at the fish and boosting him up, because that's just who Jack is. As the boy's beautiful mother runs after her son, there's a very obvious necklace dangling from her chest, and keen-eyed This Is Us fans noticed that her necklace is the one Jack gave to Kevin years later. Like with any subtle hint on the series, fans are theorizing about the relationship between Jack and this mystery local woman and how it ended up meaning so much to Jack. Reddit user Marty5151 called out the woman wearing the necklace and suggested that maybe "Jack fathered a child over in Vietnam," and she gave him the necklace to remember him by. Another Reddit user theorized that Nicky is that young boy's father "and the necklace in question really belonged to Nick rather than Jack." While we do think those ideas are a little far-fetched because the young boy who ran up to Jack looked about 4 years old, and neither Jack nor Nicky had been in Vietnam long enough to be this kid's father, it could be that Jack had a relationship with the mother. It's possible that after learning about his brother's death, Jack returns to his camp to mourn and this woman consoles him, giving him lessons in strength and perseverance, and the necklace is a symbol of all the things she taught him. When Jack gives the necklace to Kevin after his knee injury in high school, he hands it to him while talking about being strong and getting through these difficult times, the same way the necklace helped him get through the pain of his brother's death. Only time will tell what really happened to both Jack and Nicky during their time in Vietnam, but we have a strong feeling the This Is Us writers have some big twists up their sleeves.